Ferguson Effect: It’s not real, but urban murder spikes are. But in the rush to disprove it, we’re ignoring a very real tragedy unfolding in cities like Baltimore and Milwaukee. 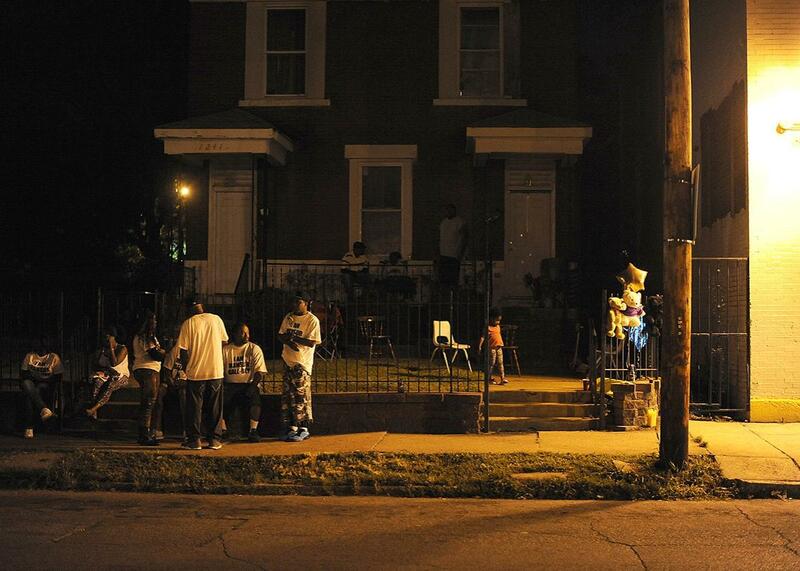 People stand outside the makeshift memorial for slain 18-year-old Mansur Ball-Bey after a protest in St. Louis, Aug. 22, 2015. Earlier this week, Manhattan Institute fellow Heather Mac Donald appeared before the Senate Judiciary Committee, at a hearing titled “The War on Police.” Mac Donald offered testimony about the so-called Ferguson Effect, a theory that says intense public scrutiny of law enforcement since the death of Michael Brown has made it harder for police officers to fight crime. The theory, which has been promoted by conservative commentators and was recently endorsed by the director of the FBI, consists of two separate components. First, it notes that the past year has seen a sharp spike in crime in many large American cities. Second, it holds that the reason for this spike is that police officers have started shying away from aggressive police work because they are worried their actions will be caught on film and that they will be targeted by civil rights lawyers and cop-hating activists, regardless of whether their actions are legitimate or not. Advocates of police reform have roundly dismissed talk of a Ferguson Effect as an attempt to kneecap the Black Lives Matter movement by blaming it for a national crime wave more imaginary than real. They were joined this week by Attorney General Loretta Lynch, who testified in the House that there is “no data” to suggest police are standing down, and Ronald Davis, a former police chief who served as the executive director of President Obama’s Task Force on 21st Century Policing, who suggested to the Senate committee that the very idea of police officers abdicating their responsibilities out of fear was an insult to the profession. The pushback against the Ferguson Effect theory should be applauded. While there is no doubt that the tense climate since Brown’s death has had an effect on police officers and how they do their jobs, the notion that protestors opposing police brutality are somehow responsible for rising crime rates is ludicrous. We must be clear, however, about what we’re saying when we argue there is no Ferguson Effect. Because homicide has become dramatically more common in a number of major American cities over the past year. And considering that the overwhelming majority of the people dying in these cities are black and Hispanic, those among us who profess to care about racial equality and the opportunities afforded to people in poor urban neighborhoods need to acknowledge that this is happening. The numbers are stark and frightening. In Milwaukee, more than 130 people have been killed so far this year, whereas the total for 2014 was 87. Washington, D.C., has seen 143 murders since January, up from a total of 105 for all of last year. St. Louis had recorded 168 murders as of Nov. 16, up from 121 during the first 10 months of 2014. Baltimore, meanwhile, recently passed 300 murders for the year—a devastating milestone the city had not reached since 1999. According to the Baltimore Sun, the homicide rate in the city—which seems to have spiked in the immediate aftermath of Freddie Gray’s death at the hands of police in April—now stands at 48.97 per 100,000, higher than it’s ever been in the history of Baltimore. It’s important not to misconstrue these numbers. They do not amount to a “national crime wave,” as Mac Donald and Sen. Ted Cruz claimed at this week’s Senate hearing. An authoritative new report from the Brennan Center for Justice confirms as much: Based on data from the 30 most populous U.S. cities, Brennan analysts found that the national crime rate is largely unchanged from last year, and the number of cities in their sample where the murder rate went up (14) is almost as high as the number of cities where it went down (11). “Murder rates vary widely from year to year,” the report cautions. “One year’s increase does not necessarily portend a coming wave of violent crime.” It could well turn out that the sudden jumps in the homicide rate on display in some of the cities analyzed in the Brennan report are the product of nothing more than statistical noise. That’s little consolation, however, for the people living in the midst of the mounting violence. It’s understandable why partisans in the criminal justice reform movement are eager to point out why the spikes in urban violence are not the result of a Ferguson Effect. But scoring that political point risks minimizing the fact that violent crime really has skyrocketed in some cities and that life for the people who live there has become scarier and more fragile in ways that are unfathomable to most of us. The mother let out an anguished scream as she reached the yellow tape surrounding Baltimore’s latest homicide scene and crashed into the chest and outstretched arms of a police officer who braced to intercept her. “My son! Where’s my son?” she cried out, collapsing to the sidewalk at the rear of an elementary school and across the street from 10 evidence markers clustered around a small pool of blood. As additional officers came to her side, the mother got back to her feet and broke away from them, running to nearby steps and gasping for air. She had learned that her 25-year-old son, Darryl Whitehead, was the victim, shot in the head in broad daylight. He had just gotten out of prison the night before, she said. He was the city’s 288th homicide of 2015. There is an understandable reluctance among advocates for change in our criminal justice system to talk about the wave of murders that is rocking cities like Baltimore. Doing so in the context of vital discussions about police brutality against black people can feel like a distraction, and it runs the risk of giving ammunition to people who will use any excuse to undermine reform efforts, whether in policing or sentencing policy. But in reading the local news coverage in these cities, where life in poor neighborhoods has become more stressful and more dangerous after years of becoming at least a little bit safer, it is hard to justify why this crisis does not have a more prominent place in the national discussion over criminal justice. “We need to talk about this, because so many people have died, and are dying,” Jill Leovy, the longtime Los Angeles Times crime reporter, told me this week. In her book, Ghettoside, Leovy argues that the indifference that America’s criminal justice system has shown the thousands upon thousands of poor black families that have lost loved ones to murder is the great moral failing of our time. Too few homicides in poor black communities are solved, Leovy writes, because our society doesn’t care enough about solving them. Leovy is one of the few voices in the criminal justice reform conversation who has stressed that being oppressed by the police is only one of the law enforcement–related problems that poor black communities face in America. Being ignored by them, she argues, is the other one. It’s important to beat back the suggestion that advocates for police reform are behind the rising homicide rates in cities like Baltimore, St. Louis, Washington, D.C., and Milwaukee. But as we argue about whether the Ferguson Effect is real, it’s imperative to remember that the reason we’re talking about it in the first place is that people in some our greatest cities are being killed more often than they used to be, and it’s critical that someone figures out why. Crime is not merely a talking point for right-wing law-and-order types, and murder, in particular, is a monster—to use Leovy’s word from Ghettoside—that preys on the nation’s most vulnerable people. You don’t need to be a reactionary, or an opponent of Black Lives Matter, to see this. St. Louis Alderman Antonio French, for instance, an unabashed advocate for police reform who became a national figure for his involvement in the Ferguson protests, has been calling on city officials to address the unceasing violence that takes place in St. Louis’ poor neighborhoods. In the rush to defend police reform efforts against critics brandishing the Ferguson Effect, too many well-intentioned people have lost sight of the profound trauma that is visited upon communities when they are torn apart by routine acts of murder. That trauma should not be denied or played down—and if there’s more of it this year than there was last year in Baltimore, or in St. Louis, or anywhere else, we should call it what it is: a catastrophe that demands our attention.